The title might look like I don't think much of the newest Humble Indie Bundle, but I mean this quite literally—the newest launch from Humble Inc has made the leap to Android phones. Luckily for me and my three year old Samsung VICE, the games come with the Windows, Mac and Linux flavours Humble fans know and love. So while I can't tell you how well I think these titles transfer to your respective Android devices, I can definitely do my usual breakdown of the PC titles offered. With two repeats and two bundle debuts, check past the break for some impressions on each. 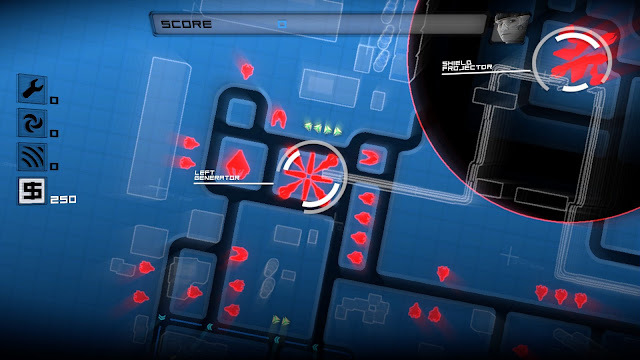 Anomaly is marketed as a tower offence, and that's pretty much exactly how one describes it. 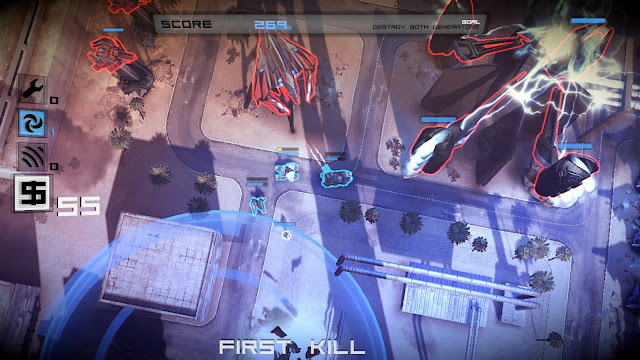 The game consists of a trip into the Anomaly, a sudden explosion of alien energy in near future Baghdad. Your role as the commander of the mission is to guide a convoy past a series of increasingly well armed alien towers to reach the mission goal. See what I'm getting at? Tower defence, but you have to protect the creeps. But is it fun? Sure is. While there's a certain degree of planning required, your main method of protecting the troops is through using various power-ups distributed throughout the levels to repair your guys and distract and neutralize the enemies. Usually this involves moving your vulnerable commander avatar into the line of fire, making great placements increasingly difficult. There's also a lot of planning involved; you have to plot the route ahead of time for your convoy. You can either make an attempt to find the path of least resistance, or plot out the route that will lead you to additional cash money in the form of energy crystals. The other major form of micromanagement is arranging your troops; you can purchase and upgrade a variety of distinct vehicles each equipped with some way of mitigating the enemy's attack, whether it's with a regenerating shield or with plain old bullets. It's a great release, and the PC version is full of extra side campaigns and survival modes to keep you busy. And while the phone version is pretty impressive technically speaking, the PC version has quite an overhaul going for it. The graphics are excellent when played in HD, easily on par with most comparable games in the same price range. There's also voice acting, which I do believe is removed in the phone version. It's fairly high quality, and nothing gets you in the mood for tower bashing quite like recieving orders from a Jason Statham impersonator. In terms of sheer horsepower and gameplay, Anomaly is probably the most "traditional" game in the pack. It's a lot of fun, and probably worth the pay what you want price of admission alone. But luckily for me, there are three more titles to get to. And we come to our first repeat. 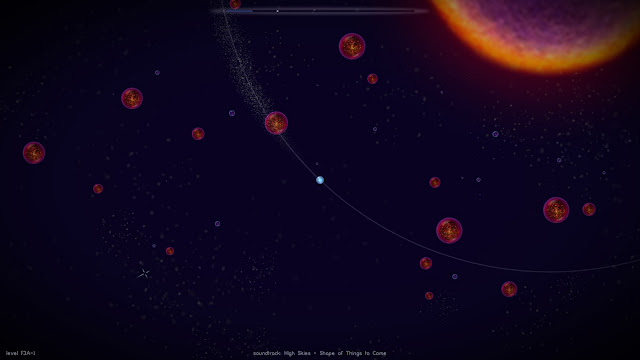 Osmos found itself in Humble Indie Bundle 2, so it's not exactly a brand new and exciting experience for me. Fortunately the Backlog Journey wasn't around back in those wild and untamed days, so I'll do a mini-review anyway. A lot of people would argue that Osmos is more of an atmospheric relaxation program than a game. Those people are wrong. Despite the dreamy New Age soundtrack and minimal presentation, Osmos manages to have all the necessary bits and pieces to call it a game. 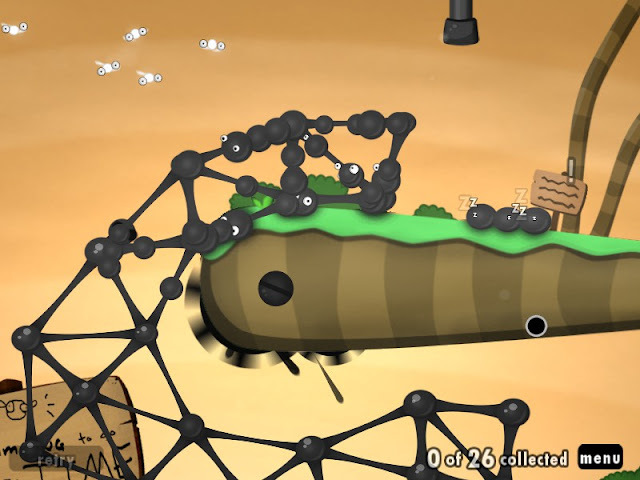 There's a wide variety of scenarios, very clearly defined goals and enemies and a smattering of achievements to unlock. The gameplay isn't exactly new; you eat smaller enemies to become bigger so you can eat more enemies. 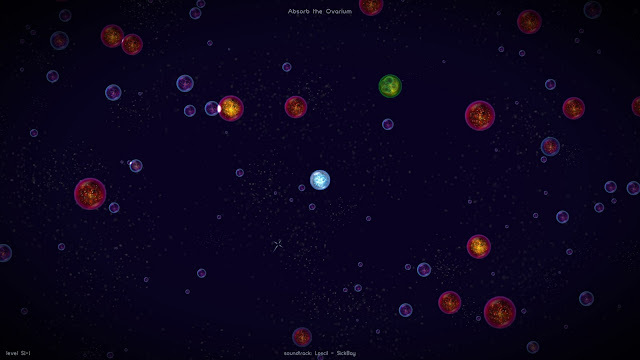 But Osmos delves into this style of gameplay a lot deeper than Fishy ever did. Moving yourself through space requires you to sacrifice a bit of your microbe as a form of propulsion. This creates a lot of interesting moments, especially when other microbes use your leavings to grow bigger as they chase you. However, it does make the game incredibly slow paced because quickly running after every enemy leaves you too small to absorb them. The game alleviates this somewhat by including the ability to control the flow of time, but the game never really reaches a hectic place. Either you start in a good spot and can leap past your foes in size, or you don't. 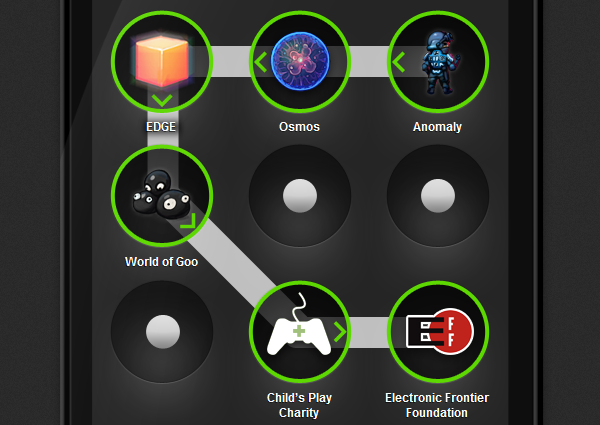 The second of three key innovations Osmos makes is the many scenarios. The game begins with a quick introduction to each general umbrella style of level (ambient oriented, survival oriented and orbitally oriented) then lets you pursue each style of level to more advanced layouts. It adds a nice structure and sense of satisfaction, giving the game more staying power than expected. But the third and probably most important detail is the presentation and the soundtrack. It's very minimalist, but not in a bad way. There's still helpful hints on the between game screens, and it's never unclear how something is suppose to work. It's a pretty perfect balance, not unhelpful yet also not handholdy. The soundtrack is similarly complimentary. I can't say it's my favourite style of music, but it's very high quality and suits the game perfectly. So yeah, I think Osmos is a game perfectly suited towards the mobile crowd, but it's certainly not a bad release on PC by any means. There's enough depth to warrant a couple of your busy hours, and I'd say it's definitely something everyone should try once. 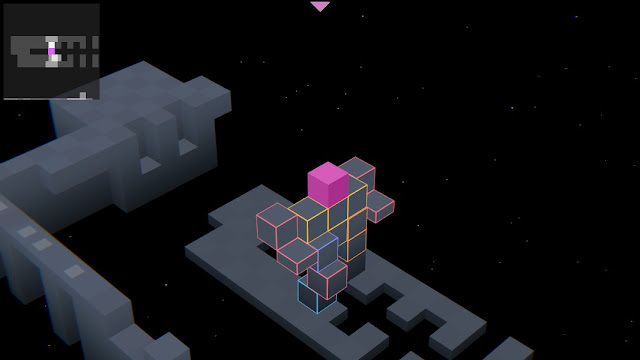 EDGE is a fun platformer with a dangerously Google-proof name and confusing release history. The game itself is an isometric platformer distilled down to its most basic elements. You control cube, and have to get to the exit; there's absolutely no story and no frills. It's game design at its most basic, and it might come across as lazy except that it really isn't. The graphics are simple, but very sharp and often pulsating with neon colours and borders. The soundtrack is appropriately entirely chiptunes based, but it's quite good and adds to the pure game design formula nicely. Your cubic avatar is mostly limited in your movement and agility but luckily it can scale short blocks and cling to walls. 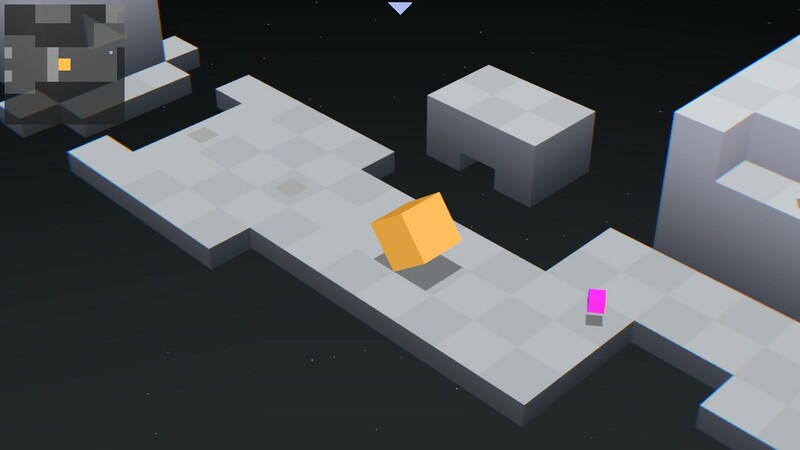 The game mostly revolves around figuring out how to traverse the landscape using the very limited movement, generally through good timing and puzzling out the best route. Despite being made entirely out of uniform cubes the level design is fantastic, with each level feeling fairly distinct and varied, and plenty of gimmicks and designs pulled from the moderately limited tool box. Even when a level mostly consists of hit the next switch, the block whiz and reform before your eyes, making for a very slick presentation. Unfortunately the game is structured as fast paced and precise, leading to a level score based on how often you die, how fast you can complete the level and how many bonus cubes you pick up. While it's great to have that incentive, my main issue with the game is the isometric controls. Essentially the game has a somewhat archaic control scheme, where up represented by north east, right by south east and so on. It's difficult to visualize and tough to get used to at the best of times, but the fast paced urge for perfection is just a step too demanding for the so-so control scheme. Maybe it would be better after a keybinding refit or when using a controller, but it just seems like the game would have been better at a slightly slower pace. Of course, you certainly aren't obligated to race through it, and once I gave up my S ranking aspirations I had a lot more fun. But in the end it's fun, it looks very cool and the controls aren't a big deal unless you strive for perfection. I'd be curious to see how it controls on a phone though. If you've followed these great pay what you want deals for any length of time, chances are you already have World of Goo. It was basically one of the first companies to use the pay what you want model way back in the day, and also found its way into the very first Humble Bundle. But maybe you missed it, or you just haven't actually opened it, or you were waiting to get it on your cellphone. Well your excuses are rapidly running out, which is good because World of Goo is one of the better casual games out there today, and pretty much a canon indie classic at this point. World of Goo is kind of an evil Lemmings scenario, where instead of leading these helpless creatures to safety you manipulate their curious nature to trick them into the Goo company vats. But the Lemmings influence is definitely there, mixed with a dash of tower building. To guide your gullible Goo balls, you can turn each Goo into a joint, where it will attach to its neighbours with rigid but flexible planks. It's a permanent transformation, so the game becomes a challenge to use the least amount of necessary sacrifices while building towards the exit pipe. Complicating things is the many varieties of Goo and the surrealistic landscapes you're tasked with circumventing. The presentation for the game is fantastic. Most of the cheerful levels includes a few hints and non sequiters by the enigmatic Sign Painter, an amusing stalker. You have cheerful levels contrasting with harrowing obstacles. The Goos themselves are simple yet adorable, with their own nonsense language mostly consisting of "YAMACKO" over and over again. If I had to compare it to anything I'd say it feels like a really well done Popcap game, but in terms of sheer charm it manages to beat the pants off anything Popcap's released lately (Plants vs. Zombies excepted of course). It's innovate, it's cute and it's easy to understand but hard to master. 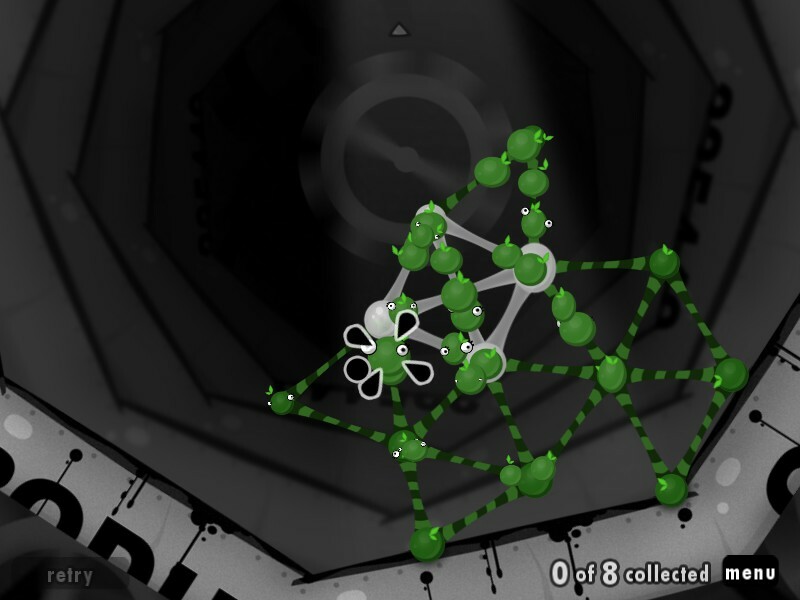 Despite being almost perfectly suited to phones, the PC version is great for killing time. It's definitely a casual game, but it's still very fun. As usual, if you like what you read make sure to subscribe to me either through Twitter, Facebook or Google+ for some more bundle reviews and some untimely game reviews. Oh no doubt. I had to stop playing the survivalist modes cause it just gets so luck based, and the orbital mode can get ridiculously aggravating. But the ambient mode is usually pretty calm. And thanks for the info on EDGE.